Singapore uses two separate systems to collect rainwater and used water. 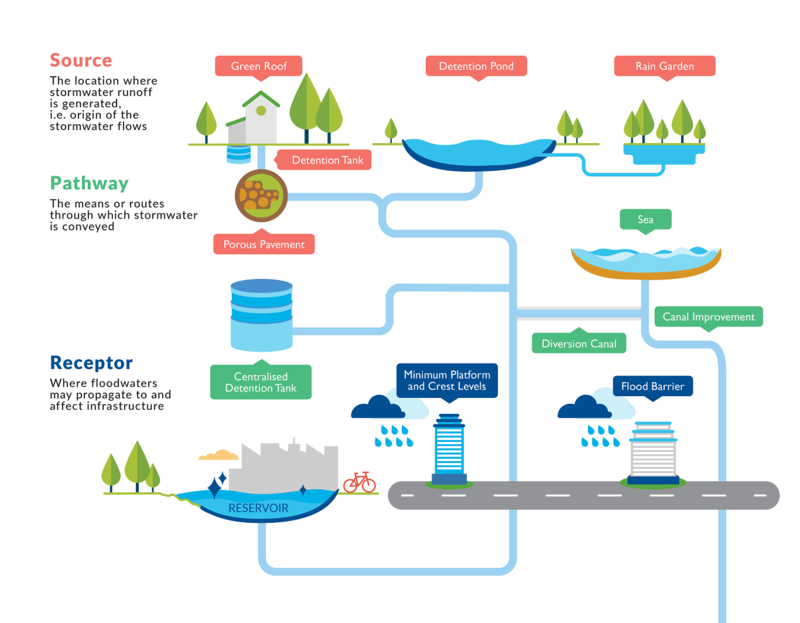 With two-thirds of Singapore as water catchment, rainwater that falls in these areas is collected through an extensive network of drains, canals, rivers, stormwater collection ponds and reservoirs before it is treated for drinking water supply. 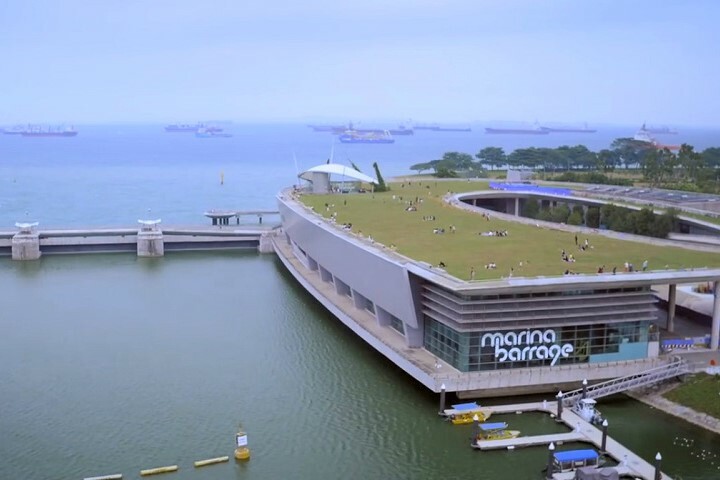 This makes Singapore one of the few countries in the world to harvest urban stormwater on a large-scale for its water supply. Singapore has about 8,000km of drains, rivers and canals. With climate change, we can expect to experience more extreme and unpredictable weather, with more frequent and intense storms. To enhance flood protection, PUB adopts a ‘Source-Pathway-Receptor’ approach, which looks at catchment-wide solutions to achieve higher flood protection. 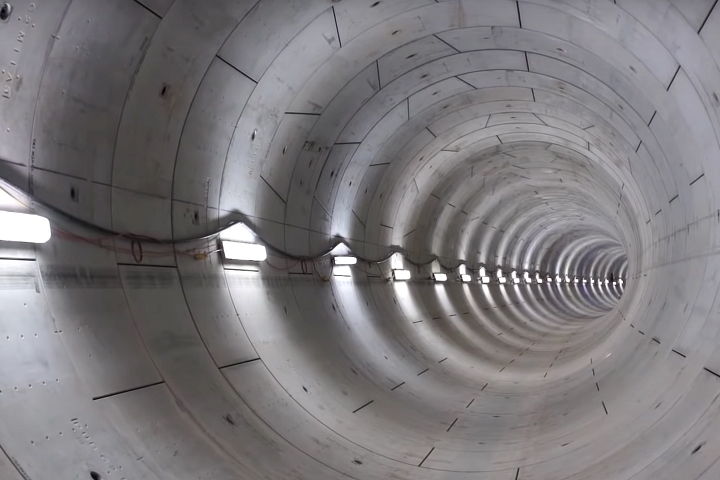 This holistic approach introduces flexibility and adaptability to Singapore’s entire drainage system, addressing not just the drains and canals through which stormwater travels (i.e. “Pathway”), but also in areas generating stormwater runoff (i.e. “Source”) and areas where floods may occur (i.e. “Receptor”). Since January 2014, all new developments and re-developments of 0.2 hectares or more are required to implement “source” solutions to slow down stormwater runoff entering the public drainage system. These on-site measures could include detention tanks or rain gardens and bioretention swales. To enhance our “pathways” to cope with higher intensity storms, PUB raised the design standards in 2011 for drains to cater for more intense rainfall events. Depending on the size of the catchment, this could mean an increase between 15% and 50% in drainage capacity. “Receptor” solutions aim to provide additional flood protection for buildings and key infrastructure. Some of these measures include setting minimum platform and crest levels and placing flood barriers to prevent floodwaters from entering buildings. 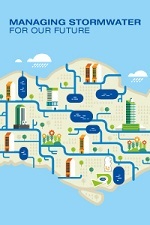 The “Managing Stormwater for Our Future” publication presents an overview of PUB’s stormwater management strategies, approach and requirements that will help prepare Singapore for the future. It also outlines plans for 12 waterways in Singapore. The publication is published in March 2014. The ‘Source-Pathway-Receptor’ approach was adopted by PUB in 2012 following recommendations from the Expert Panel on Drainage Design and Flood Protection Measures that was appointed by the Ministry of the Environment and Water Resources (MEWR) in June 2011. The expert panel comprised members from academia, professional bodies, private and public sectors, with fields of expertise in civil and hydraulic engineering, flood control and climate. The expert panel conducted an in-depth review of Singapore’s rainfall patterns, drainage infrastructure, current and future drainage improvement plans, and flood monitoring. To view executive summary of the Expert Panel’s recommendations, please click here. For full report on conclusions and recommendations of the Expert Panel on Drainage Design and Flood Protection Measures, please click here [PDF].